Christmas Eve in 1977 at a disco nightclub in Philadelphia, club singer, Deloris Van Cartier, and her two back-ups are performing in front of an empty house. Van Cartier’s boyfriend, Curtis Jackson, owns the nightclub. Curtis tells her he cannot join her for Christmas Day but gives her a coat, which she discovers belonged to his wife. Hurt and frustrated, Deloris goes to her backup singers, Michelle and Tina, about her dreams of stardom and fame. She decides to break up with Curtis and heads out of Philadelphia to go fulfill her dreams, when she happens to witness Curtis and his crew murder someone. Accused of “squealing” to the cops, she becomes terrified and runs away as Curtis orders his men to get her. Some time later, Deloris runs into a police station and tells the desk chief, Eddie, about what has happened. Eddie sends Deloris into the witness protection program and sends her to the place he believes Jackson will never find her: a convent! When Deloris arrives, she is disappointed to learn that contact with the outside world is limited and that she cannot smoke, drink or wear any of her less-than-appropriate clothing. Meanwhile, back in his nightclub, Jackson is frustrated that he cannot find Deloris anywhere. The following morning, Deloris attends the choir practice and realizes how bad the situation is. Deloris offers to teach them how to sing in key and on time. That Sunday, the choir performs a rousing, up-tempo hymn. Although the church is struggling, the improved performance and new material bring an influx of donations and membership. Mother Superior, however, is horrified at how the simple, traditional choir she knew has changed and become modern. The choir becomes very successful and has made a lot of money for the church, which allows it to be remodeled and fixed. However, Mother Superior wants rid of Deloris. Monsignor O’Hara brings news that the choir has been asked to perform a special concert for the Pope. However Curtis sees Deloris accepting the invitation on TV and sends TJ, Joey and Pablo to take her from the convent. The truth about Deloris is revealed to the superfluity when Mother Superior informs her that the court date for Curtis has been moved and she must leave immediately. Deloris runs from the convent and stays with Eddie, whilst initially happy that she will testify against Curtis, she feels guilty for leaving her sisters when they needed her, realising that the choices she makes will leave her with nothing but fame and money. She therefore returns to the convent and sings with her sisters. Elsewhere, Jackson thinks up a new way to get into the convent, dressed as nuns, Curtis, Joey, TJ and Pablo sneak into the convent. They find and chase Deloris. The nuns see this and they all prepare to protect Deloris, standing in front of her when Curtis confronts her. Eddie prevents Curtis from shooting the nuns, arrests Curtis and his men, and then shares a passionate embrace with Deloris. The performance in front of the Pope begins, as the nuns sing in harmony, led by a changed Deloris Van Cartier. 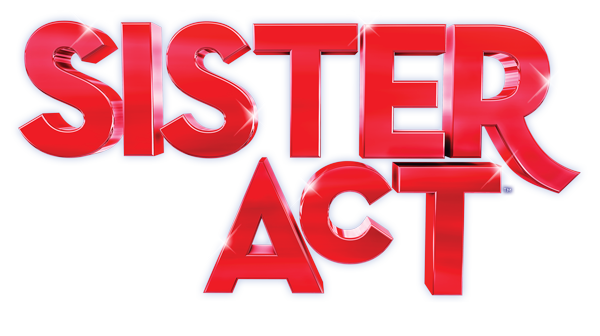 It was a Saturday night and I found myself, once again, at The Priory Centre in St Neots for VAMPS’ production of the all-singing, all-dancing, toe-tapping musical that is Sister Act. There are some fantastic numbers in this show and I was looking forward to a great night’s entertainment. I was warmly welcomed, as always with VAMPS, by the excellent front of house team and shown to my seat, which was at the very back of the theatre. This did, I’m afraid, have some bearing on my enjoyment of the show, as I found myself unable to see any detail in facial expressions and did unfortunately struggle to hear some of the dialogue – more about that later. The opening numbers ‘Take Me To Heaven’ and ‘Fabulous Baby’, with the talented Tanya Grisson in the lead as Deloris Van Cartier, should have opened the show with all the pizzazz of the Pittsburgh nightclub where it is set. These are fantastic songs and I so wanted it to explode onto the stage and wow the audience right from the start. I felt that there were some missed opportunities in direction here. With just three performers (Tanya and her backing singers, Jenny Coates and Emma Verney-Davies) and a blank set, the atmosphere for me was somewhat lacking and did not blow us away as I would have liked to open the show. Perhaps using some of the many nuns, who appear later on, as punters in order to create a cabaret scene here would have added to the imagery on stage as well as some more use of lighting effects. I do feel that, where given the opportunity, the opening number of a show should indeed ‘Take Us To Heaven and be ‘Fabulous Baby’ – and it was, in this instance, handed to director Isabella Coleman, on a plate but for me unfortunately, failed to deliver. Don McKay did a good job in the role of Curtis, although Don, you were just a bit too nice for me! I would have liked to see you a bit more threatening, more sinister – although, having said that, in true panto style, the audience booed as you took your bows, so a job well done. Huw Nadin, Peter Crawford and Liam Hicks did a sterling job in their comedy roles as the bad guys and Curtis’ henchmen. Some very entertaining dance numbers, with choreography from Emma Driscoll, from these gentlemen and their enthusiasm was infectious – very well done! Ian Wurzfold, as Sweaty Eddie, kept us entertained with his physical comedy (falling off the chair) and solo numbers. His song “I Could Be That Guy” had fantastic costume changes – huge congratulations to wardrobe (Sally Ritson) and those involved on stage to create the magic. Very effective and beautifully executed. Mother Superior, Peta Riley, had some lovely solos and brought a sense of normality and calm to proceedings, whilst George Kelly as Monsignor O’Hara showed us his great acting range as he went from the man in charge to manic song and dance man in the finale number – super stuff! And now to our Sisters. There were far too many to mention everyone, and at times this made the stage rather crowded, but plaudits must go to Laura Blackmore for some lovely acting and beautiful solos and also Emmeline Lyster, Emma Driscoll, Anne-Marie King and Sally Ritson. When the nuns all sang in chorus, these numbers were super and the lifted the atmosphere enormously. The closing songs of Act l are fantastic and VAMPS truly raised their game and their voices here to close the first act in style and left the audience tapping its feet and in high spirits. Act ll continued to delight and again the super songs carried the piece through to the end, where Tanya shone in her role. There were some lovely lighting effects (Dave and Kate Maltby), especially the use of projection on the walls to create the convent all around us. I felt that more use could have been made of the glitter ball immediately above the stage, for example in the opening nightclub scene, the bar or the big numbers at the end. Every set seemed to have scenery placed centrally which sometimes meant that the stage looked crowded. Perhaps consider placing it at an angle stage right or left, to allow more central space. This would have helped in the bar scene, where more people were needed to create the busy bar atmosphere. Also, the background bar music was too loud here and unfortunately drowned out much of the dialogue for me at the back. This was apparent throughout the show and I found it hard to pick up on some of the dialogue, particularly where it came in the middle of a song. This was a combination of mics and technical issues but also a need for the cast to really project right to the back of the space as I felt that a lot of the action was played to the first few rows only. The band played beautifully throughout, led by Chris Phelps – and the backstage crew did an excellent job with generally smooth scene changes. The large church set was appropriate to the space and set the scenes nicely. As the show ended and the audience left singing and dancing their way into the foyer, there was a lovely hint of VAMPS’ next production, with a promotional stand and two puppets interacting with people as they passed. A lovely touch and a great way to let your audience know about Avenue Q, another super show and I very much look forward to seeing what VAMPS can do with this great production next year.